Symptoms of Perthes’ disease include tiredness and pain in the groin, thigh and sometimes in the knee. Pain can be felt in the knee only, even though the disease affects the hip. The child may have stiffness and reduced range of motion at the hip joint and may walk with a limp. The affected leg may appear shorter than the other leg. Symptoms will usually be on one side only. Perthes’ disease commonly affects children between the age of 4 and ten years old. But can also occasionally occur in older children and teenagers. The condition is sometimes also called Legg–Calvé–Perthes disease. The cause of the disease is not known. 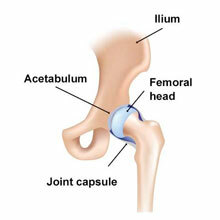 It affects the hip joint, where the top of the femur (thigh bone) meets the socket of the pelvis (acetabulum). The blood supply to the head of the femur is disrupted, resulting in necrosis where the bone softens and begins to break down. 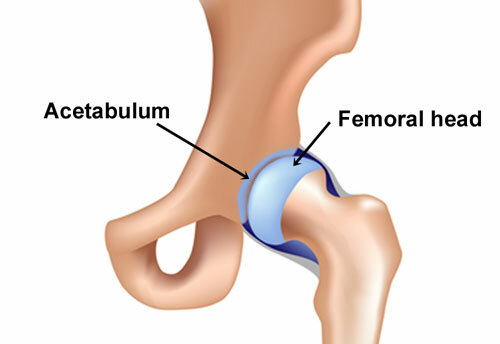 Once the blood supply returns to normal, the bone tissue is laid down and the femoral head reforms and hardens. This will occur over a period of 1 to 3 years. Due to the joint being a ball and socket, one of the main problems is that the re-growth may not form in a spherical shape as before. The severity of deformity of the head of the femur determines the degree of symptoms and if there are likely to be any future problems such as a permanently decreased range of motion at the joint and arthritis. Boys are far more likely to develop this condition than girls, although girls tend to suffer from more severe symptoms and future problems. Symptoms are usually only in one hip, although occasionally can affect both sides. It is important that any pain in the knee or hip joints in children should always be looked at by a medical professional. A correct and early diagnosis is important as long term damage and complications can develop if the condition is not managed. A doctor may X-ray the hip to help diagnose the cause of hip pain. However, in the early stages of the disease, an x-ray may appear normal and so other investigations such as MRI or bone scans may be performed (read more on medical imaging). Depending on how severe the disease is will determine whether it requires conservative treatment or surgery. Treatment consists of rest from any aggravating activity or exercise and maintaining range of motion in the hip through mobility exercises. In particular, exercises to maintain abduction of the hip (moving the leg out sideways) and internal rotation of the hip. Treatment will depend on the age of the child and the severity of the condition but may include bed rest, crutches, traction, a plaster cast, leg brace or surgery in extremely severe cases. Arthroscopic (keyhole) surgery is done to remove loose bodies within the joint and repair damaged cartilage (chondroplasty). Perthes’ disease will usually resolve over time as the athlete grows as long as it is managed properly. Athletes can return to sport when they are free of symptoms. With competitive young athletes managing injuries and diseases is important. This may mean changing sporting activity for a while, or reducing the volume of training and focussing on quality. For example, a young soccer player may play once or twice a week and substitute other activities such as swimming, or light technical training. If Perthes’ disease is not managed correctly then long term complications include arthritis because the surface of the joint is irregular, resulting in faster wear and tear. Expert interview: Sports Physiotherapist Neal Reynolds explains ‘growing pains’ in children. Other injuries which predominantly affect children during a growth spurt are Osgood Schlatter disease in the knee and Sever’s disease at the back of the heel.